The Wetz family purchased the home ranch in 1907. LeRoy and Shirley (Packer) own the Wetz Stirrup Ranch since 1997. It is located 16 miles east of Vale, South Dakota along the Belle Fourche River. They raise horses for the ranch and arena work over 40 years. They like to say they are one horse trailer horses, Bone, Brain, and disposition. 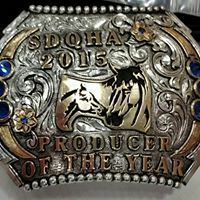 The Stirrup Ranch QH was awarded the 2015 South Dakota Producers of the Year. Family is important, they have always tried to keep themselves, kids and grandkids mounted with confirmation, good feet, legs to do a full day’s work. The grandkids are the 6th generation to live and work on the ranch. The Coffee pot is always on and visitors are always welcome! !